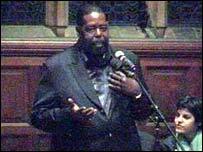 It was too tempting a culture clash to pass up - Barry White, the American walrus of love, was taking part in a question and answer session at the Oxford Union, the breeding-ground for the British establishment. But the legendary singer left his 900-strong audience spellbound for an hour in October 2000, recounting tales from his past and letting them into a few of the Walrus of Love's secrets. Later, he held court with journalists in the union's sumptuous library. In the plush surroundings, it really did feel like an audience with a legend. The first thing that struck you about him was his size. The second thing was that legendary voice, rumbling as if an underground train was passing beneath the building. He spoke in what can only be described as slow growl, pausing occasionally to emit a mighty roar as he cleared his throat. But he was totally at ease with an audience which had grown up with his love songs, and rediscovered his music through TV comedy show Ally McBeal and the revival in disco music. "It was like they were my children - I would never lie to my children and it was like they were my children tonight," he said. The message he preached was one of self-reliance, how he turned his life around after being jailed as a teenager. "I made my mind up, nobody else's mind, that I was going to change my life, my attitude, and change the way I looked at my life and life itself," he told the audience. "Because of that, I'm able to spend time with you tonight." White spoke about his brother Darryl's murder in 1983. He was shot in a row with a neighbour over change from a $20 note. "He wasn't strong to make that commitment to change," he said. "There's a lot of things that go against us as black people. I feel it's up to us to become examples to other black people. When we get a chance to encourage other black people, to get their heads together, that should be our greatest obligation in our lives." White grew up a churchgoer, and he added: "There's no God greater than the God that lives within you." All this may sound pious in print, but White delivered his answers with passion and humour. He railed against the music industry, saying it treated artists unfairly, blaming it for the problem of internet piracy. "It's why people are rebelling - there's a lot of things in the idea of free music. Some artists have been treated fairly, but they are the ones who have demanded it through sales of records and having the right attorneys," he said. But what the students really wanted to know was his tips on love - one shy young man asked what his favourite pick-up line was. "Pick up what? ", White grinned. "If I see a lady, I walk over to her and say what I'm feeling. 'I like the way you look, baby. I would love to get to know you better.'" And asked whose records he played in more intimate moments, he declared: "I don't make love to nobody's music, not least my own." Later, in the library, he spoke about his plans for the future, to keep on touring - "and making people happy" - and of taking a break at Christmas to "enjoy my lady". Asked what his tips were for aspiring artists, he told BBC News Online that he feared younger artists were too naive about the music industry to survive. "They will not enjoy words like longevity - for a lot of artists like myself, it feels like longevity is over now," he explained. "They'll be dealing with memories of 'Once upon a time, I made a record'. "You have to have knowledge to deal with things," he said, looking around at the books in the library. "This tells me that whatever I do in life, I've really got to learn about it. I had to learn how to produce a record, and to sing. When you skip over learning, it comes back to haunt you later." 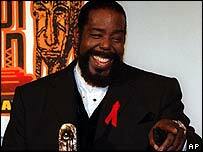 Barry White was a big man in more ways than one, and that night at the Oxford Union is a reminder of the unique talent that has been lost with his passing. "Always go for what you believe in, and try to be as original as you can," he said, describing the advice he would give to anyone starting out. "Go for the moon, and hope you catch a star."